After rolling out the driver safety program across the company Coach Servicesfound that the initial driver resistance to the technology quickly turned to enthusiasm. “Our drivers’ initial reaction was that they already know how to drive well. They were skeptical that there was room for improvement. 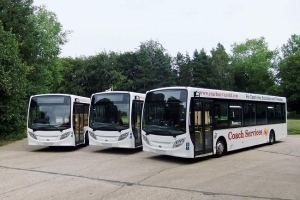 But GreenRoad has challenged them to drive differently (and safer) by understanding their vehicle and the huge impact resulting from small movements,” said Robert Crawford, Transport Manager at Coach Services. “Our team of drivers has risen to the challenge and changed their driving for the better. In particular they are now better at planning ahead and anticipating events such as slowing down sooner for roundabouts and corners.“ Both Belmont and Coach Services were thrilled with the results achieved uring an initial 30-day blind profiling period. Coach Services recorded a safety score of 60 excessive maneuvers for every 10 hours of driving. Once GreenRoad driver feedback was switched on, this figure dropped to an average of 20 – a 67 percent reduction.